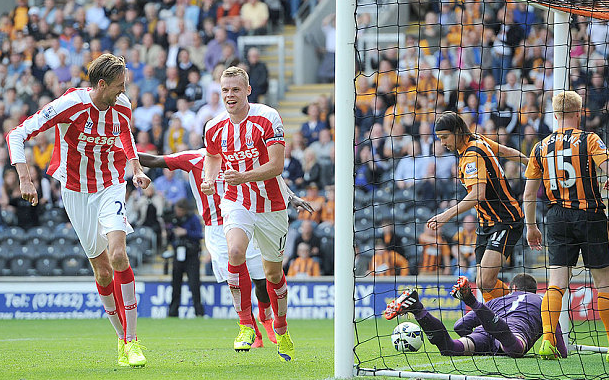 10 man Hull were left reeling after a late Ryan Shawcross equaliser dented their perfect start to the season. The hosts came into the match off the back of a fine 1-0 win against promoted side QPR last week while Stoke were still reeling from last week's home defeat to Aston Villa. A high-tempo start from both sides, but no clear cut chances. Then in the 14th minute, a horrible backpass from Jake Livermore put the Tigers in trouble, forcing James Chester to bring down Glenn Whelan and earn himself an early bath. The home side were now under mounting pressure as Stoke's Erik Pieters and Steven Nzonzi went close. Astonishingly, Hull then took the lead as Nikica Jelavic's predatory instinct helped him to gobble up a rebounded shot. In the second half, more of the same, Stoke desperately pumping the ball forward and threatening through Bojan and Marko Arnautovic. The tension was becoming close to unbearable inside the KC Stadium in the final stages as Stoke ramped up to top gear. The home fans were silenced and the away fans exploded into life with six minutes remaining on the clock, Ryan Shawcross seemingly saved a point for the Potters by stabbing in from close range. Stoke piled forward late on to push for a winner, but the final wistle was blown by referee Jonathan Moss, and both sides had a point to show for their efforts from a scrappy but entertaining match. Hull City vs. Stoke City in the Barclays Premier League.